What is sustainable development, beyond an overly ambitious slogan? After this forum, I can now speak to its necessity and vision. While development is a universal pursuit, we as beings simply cannot afford to develop without minimizing the environmental and human costs. When Madam Amina Mohammed spoke at our annual EPIIC symposium, she rationalized the sustainable development goals in the terms of inclusive growth and fair globalization. 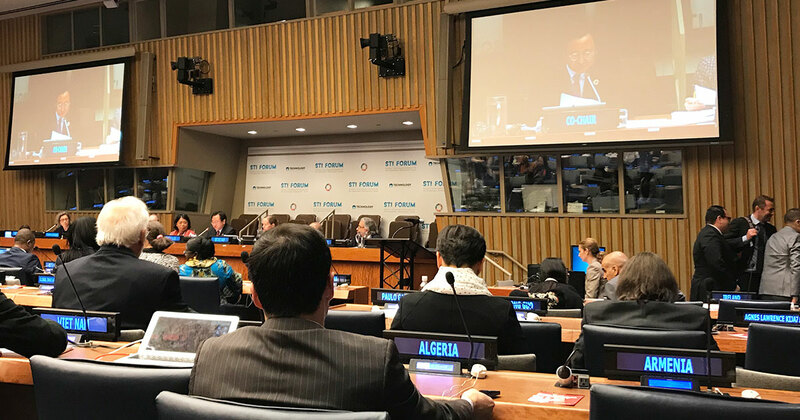 The STI Forum is a thin slice of the SDG discourse, with a special focus on integrating science, technology and innovation into the implementation of the goals. In particular, this year’s forum reviews SDGs 6,7,11,12 and 15. For example, the session on SDG 6 highlights technology solutions to universal water and sanitation challenges. This was much more specific than the broad rhetoric that I expected. Why is this conversation taking place at the UN? Well, there is no better place than the UN where states, the private sector and civil society can all come together. Compared to the discussion on peace and security, the topic of sustainable development seems to generate more goodwill and friendly statements. Perhaps the most thrilling aspect of the forum was to witness some of the conflicts. Countries at different economic levels have disparate agendas. For example, a Japanese professor and a technologist from the Silicon Valley expressed concerns about tech giants socializing externalities. They argued for more regulations and redistribution in the tech space. However, a minister from the Caribbean wanted to gain technology transfer and catch up before regulation could take place. He sharply pointed out that least developed countries need STI not because it is “interesting”, but because it is required to ensure survival in the ever-deteriorating environment. From the outset, I was exposed to the different realities faced by stakeholders. As the forum proceeded, I increasingly heard the word “capacity-building”. Most stakeholders agreed on the importance of funding and training. For example, when experts from developed countries offer advice to the least developed countries, they need to ensure that the “mentees” receive training and funding to implement the plans. The discussion on “capacity-building” encompasses so much more, but it is a useful starting point. As I observed the arguments by panelists from various sectors, I also pondered over the role of youth. Why am I here in the first place? What is the Major Group for Children and Youth trying to do? How can I contribute? One day before the forum, I was introduced into the MGCY space through a preparatory meeting. We reviewed the group’s history, mission and collective stance on the SDGs. By definition, anyone under 30 qualifies as youth. I concluded that the meaningful participation of the youth has unique contributions to the STI discourse in three aspects. First, many young academics and professionals have first-hand knowledge of the most advanced science and technology. In our group, I met an economist studying sustainable freight transportation, a geologist working on disaster risk reduction, and an engineer specializing in systems analysis for water and sanitation policies. Second, young people will inherit the world by 2030 and bear the consequences if the environment keeps deteriorating at today’s rate. Therefore, active engagement that shows our preferences today could bring about the future we want to see. Third, despite the lack of experience, young people have energy and innovative minds. Through engaging with peers in the MGCY, I am starting to find my place in this chaotic process.